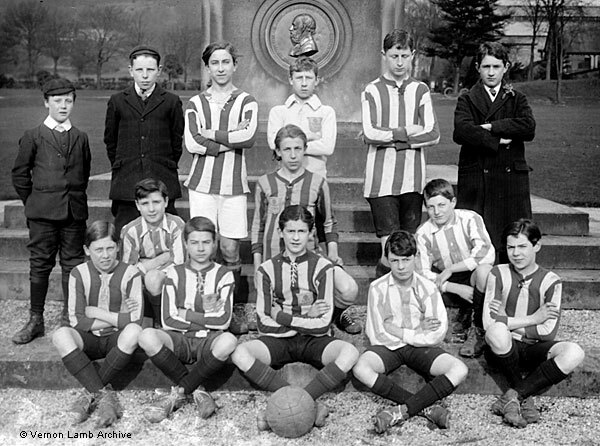 Description/Historical Information: Lady Manners School Football Team, beside Whitworth Memorial. [Front row]: G. Petts, A Gillott, W. Holland (capt. ), W. Duckmanton, J. Howard. Record: Played 10, won 5, lost 5, goals for 63, gols against 36. The photo and information was published in the High Peak News on 14 Mar 1914. Unfortunately, the newspaper did not publish the names of the three boys not wearing football strips.